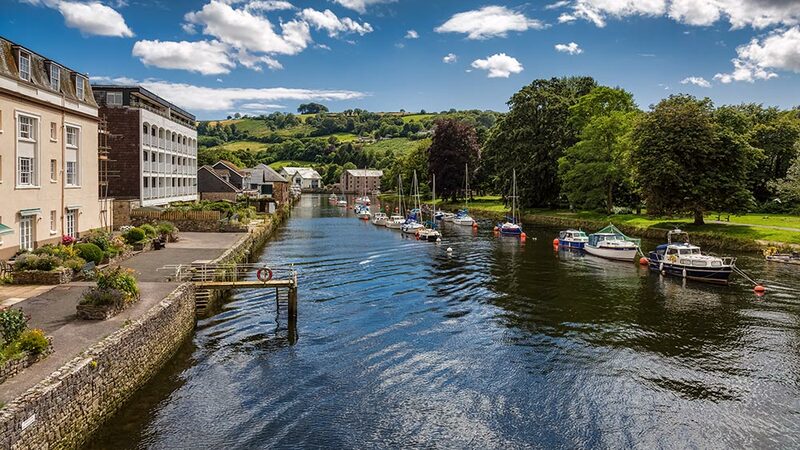 Set in the heart of South Devon, between the wilds of Dartmoor and the coastal waters of Start Bay, lies the historic Saxon market town of Totnes. Once a hub for successful local merchants, in more recent years, the town has become well- known for its bohemian quarters and hipsterish flair. It’s no wonder this colourful and flamboyant South Hams town has become a such a hit with all of our guests who visit. 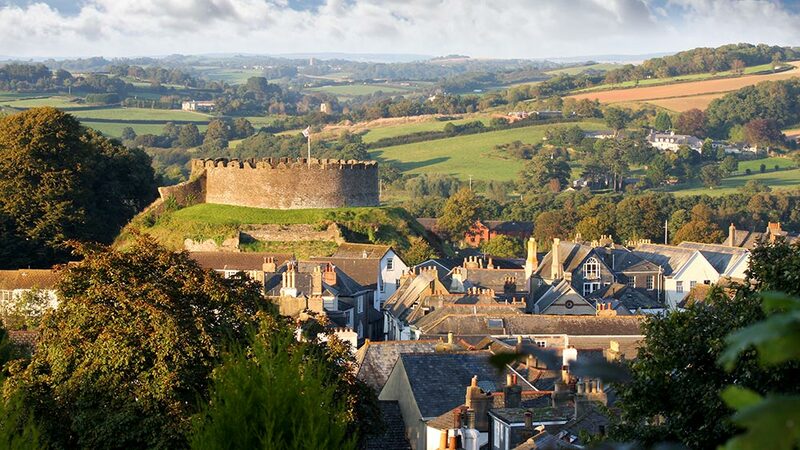 At the top of town stands Totnes Castle, a classic example of a motte-and-bailey fortress with a stone shell-keep that crowns its grassy mound. From the summit you can enjoy beautiful rooftop views all the way to the River Dart. Keep an eye out for the graffiti on the trees around the castle, hand-carved by Italian prisoners of the Second World War. One of Totnes’ most historic buildings is the Grade I listed 16th century guildhall on Ramparts Walk, just off the bustling high street. Home of the town council for over 450 years, this charming Tudor building still houses the table where Oliver Cromwell sat in 1646 during the final throes of the English Civil War. Culture vultures might also enjoy a visit to the ruins of Berry Pomeroy Castle; a once celebrated example of ‘picturesque’ architecture dating back to the 15th century. Surrounded by a gorgeous wooded valley, Berry Pomeroy is now well-known for its spooky ghost stories. One of the most celebrated is that of the ‘White Lady’; said to be the apparition of Margaret Pomeroy who, legend has it, was imprisoned in the castle dungeons by her jealous sister. What better way to learn all about the rich and colourful history of Totnes than a visit to the Totnes Museum. Take a tour around the museum’s medieval kitchen and climb the iconic spiral staircase carved from a ship’s mast. Here you can learn all about Totnes’ most ‘illustrious son’, the eminent mathematician Charles Babbage; inventor of the very first mechanical computer and ‘the father’ of modern day computing. Totnes Museum has its very own feline ghost with visitors regularly reporting to have been brushed up by the tail of an invisible cat. Wildlife enthusiasts should head to Totnes Rare Breeds Farm; a family-owned attraction dedicated to the preservation of endangered farm animals. You can visit the farm via the South Devon Steam Railway, which runs along the River Dart valley. Shops and markets flourish in Totnes, which flies the flag for both Fairtrade and ethical retail. The High Street is lined with artisan outlets, independent traders, galleries and boutiques, arts and crafts and curiosity shops. You can quite easily lose an afternoon mooching along these attractive and vibrant streets full of friendly and welcoming merchants. Make sure to visit Earth.Food.Love, the zero waste shop which sells organic wholefoods that you can fill up in your own containers. A regular market takes place on Civic Square every Friday and Saturday, which is full of exciting local fayre, antiques, collectables, and unique and unusual products, and is a must for anyone visiting Totnes. 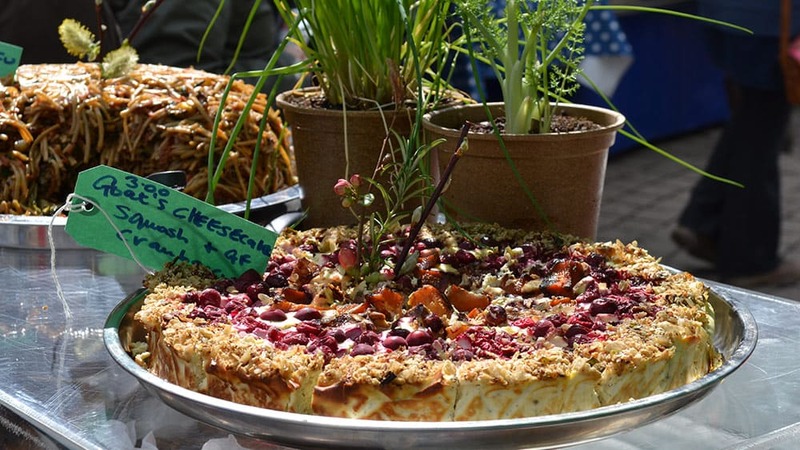 Foodies should take note that, on the third Sunday of every month, a ‘Good Food’ market is held in the town offering up the very best from local growers and producers. 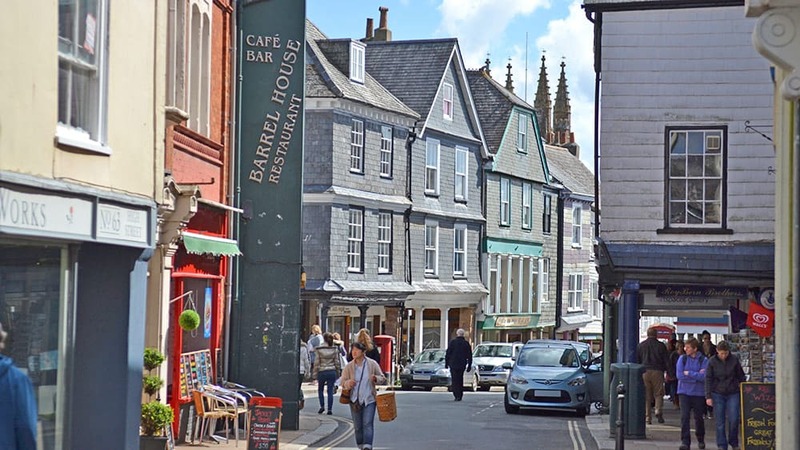 You’re spoilt for choice if you want to eat out in Totnes; from its uber-cool restaurants and bistros to its on-trend cafés and delicatessens, this really is a foodie’s heaven. Also as vibrant is the Totnes pub scene, with a long list of well-established free houses for punters to discover. If you’re a lover of live music, make a beeline for The Dartmouth Inn which holds regular folk music nights and weekly gigs. If you’re feeling peckish, head for ‘Pie Street on the High Street’ for some ‘British Soul Food’…the Vegetarian Homity pie – made from locally grown tatties and leeks with proper West Country cream cheeses – is a real winner!! One of Totnes’ most cherished beauty spots can be found not far from The Plains and Ticklemore Street at the bottom of the town. Vire Island takes its name from Totnes’ twin town in Normandy and is a leafy enclave where you can enjoy an idyllic riverside picnic. Not far from this tranquil spot are the three arches of Totnes Bridge. Crossing the bridge leads you into Bridgetown; a small suburb on the eastern slopes of the valley where you can enjoy gorgeous riverside walks from the Longmarsh and beyond. Another scenic spot where you can while away an hour or two is the Leechwell Gardens; a secret corner of Totnes that’s home to an abundance of horticulture and wildlife, all lovingly maintained by local volunteers. It you like the sound of a day spent messing about on the river then Totnes is certainly the place. 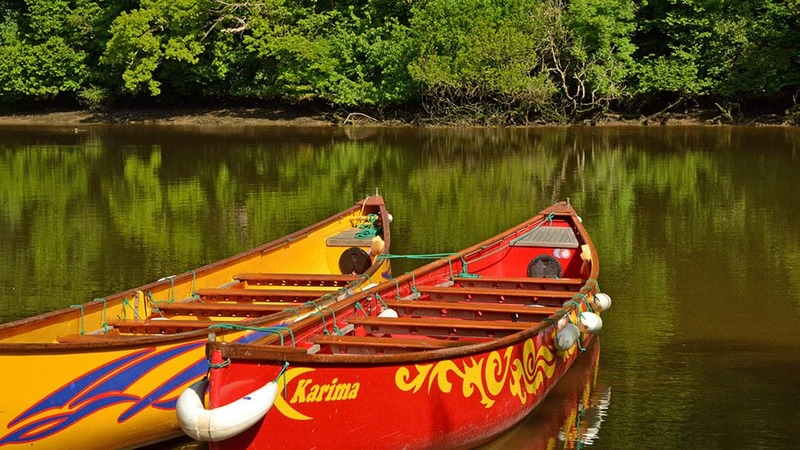 Canoe Adventures offers fun-filled days out on the River Dart and a variety of paddling escapades. If that all sounds like too much effort, why not hop aboard the Totnes to Dartmouth river cruiser and savour some of the region’s most enchanting waterways. All of these sites can be discovered along the Franklin Trail, a circular walk around Totnes designed by members of the local ramblers association. Follow the waymarks along riverbanks and cobbled byways for a wonderful six-mile yomp around one of South Devon’s most characterful towns. A self-catering holiday cottage in Totnes gives you the freedom to discover the town at your own pace. After a long day exploring, you’ll have a comfortable and relaxing cottage to return to. You can eat out at Totnes’ many restaurants, or can stock up on lots of fresh, local produce from Totnes market and cook up a storm in your very own kitchen. Couples will love Riverside Loft, a stylish waterside apartment overlooking Vire Island and the River Dart. Wake up to views of Totnes’ Castle from Stable Cottage (sleeps 5) or 10 Castle Street (sleeps 6), both characterful cottages tucked beneath the ancient castle walls. 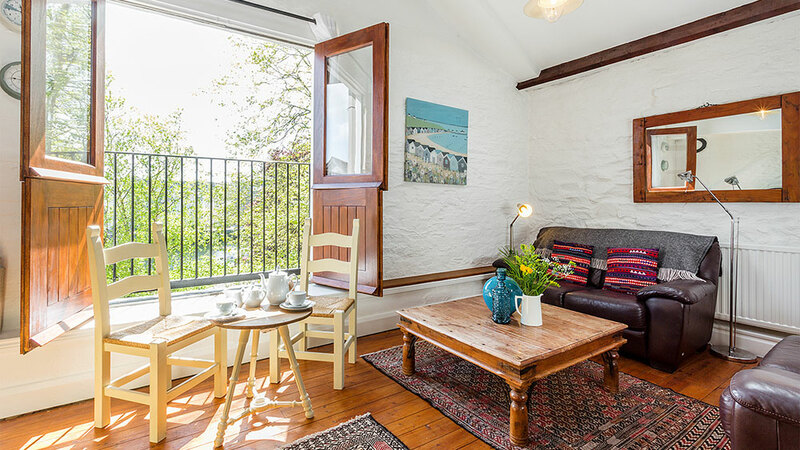 For dog owners, 2 North Castle Mews (sleeps 6) is a colourful and contemporary dog-friendly townhouse, just moments from Totnes’ high street. With a large garden, trampoline and use of an indoor swimming pool, Staverton Manor Apartment is perfect for family holidays. Part of an impressive Victorian Villa just three miles from Totnes, the property, which sleeps six, is peaceful and private and has beautiful views over a lake. Come and have a look at Toad Hall Cottages’ impressive selection of holiday properties both in and around the historic and characterful town of Totnes.